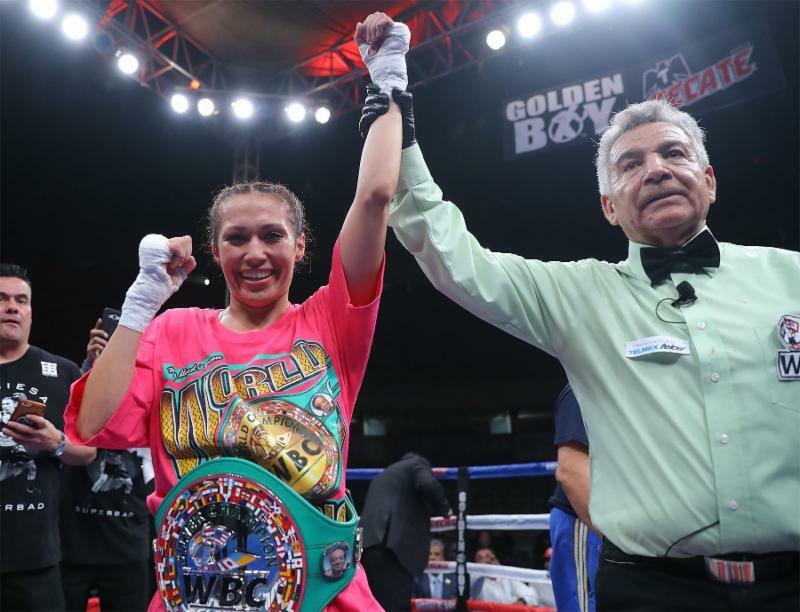 MEXICALI, MEXICO (Nov. 17, 2018): Seniesa 'SuperBad" Estrada (15-0, 5 KOs) of East Los Angeles, Calif. scored a fourth-round technical knockout victory against Debora Rengifo (10-6-1, 5 KOs) of Rio Chico, Venezuela to capture the vacant WBC Silver Light Flyweight Title in the scheduled 10-round main event of "Mexicali Al Grito De Guerra" at Plaza De Toros Calafia in Mexicali, Mexico and televised on TV Azteca. "I'm so honored to have fought here," said Seniesa Estrada. "It was a great atmosphere here with the Mexican fan base. I want to be the best in the world. I want to fight the best and get all the belts. I feel great. I had a cold all week. I was kind of nervous about how my body would feel going in. I stuck to the game plan. I wanted it to end early and it did." "I was hurt in the first round, but I continued," said Debora Rengifo. "I didn't expect this result. I prepared to win but these are things that happen in boxing. She [Estrada] had a very complicated style." Estrada vs. Rengifo was a 10-round fight for the WBC Silver Light Flyweight Title presented by Golden Boy Promotions. The event was sponsored by Tecate,"THE OFFICIAL BEER OF BOXING. "The fights took place on Saturday, Nov. 17, 2018 at Plaza de Toros Calafia in Mexicali, Mexico. Follow on Instagram @GoldenBoyBoxing and @OscarDeLaHoya. Follow the conversation using #EstradaRengifo. Photos and videos are available to download by clicking here. Credit must be given to Golden Boy Promotions for photos and videos used.